08.04.13 Minneapolis here come the Chauvins! Roy and I went to Minneapolis this week. It’s a 5 hour drive south from Kabetogama. 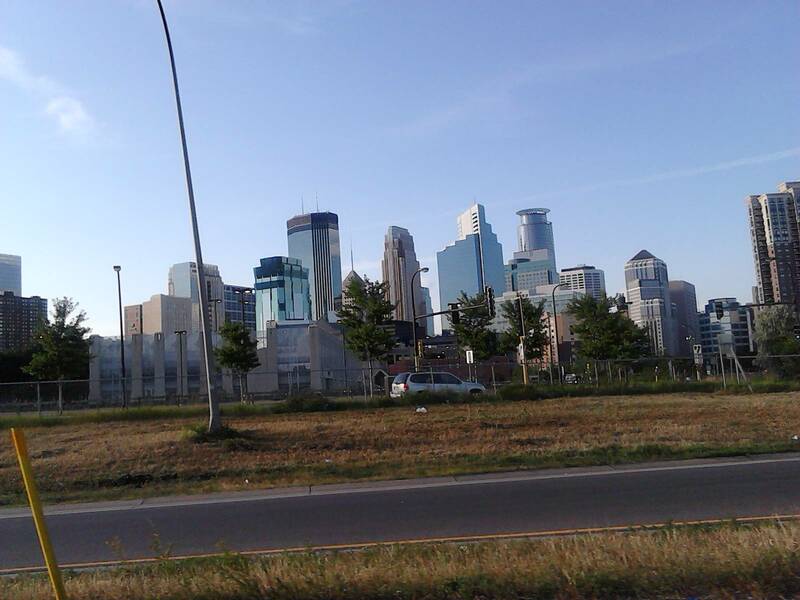 One of the things I noticed quickly as we got close to Minneapolis was that the road side grass and weeds in the city along the highway didn’t seem to have been cut all summer. I thought, Goodness even in poor little Louisiana the roadsides get cut, especially in the bigger cities which Minneapolis is. When we returned to the resort I shared this thought with Beth (one of our co-workers here) and she told me that it is a law that they don’t cut the grass because it is a nesting place for pheasants. Once the pheasants have finished nesting they cut the grass. Those pheasants sure have a lot of nice nesting places. I googled to find out more and this protection of the pheasants nesting place is true. 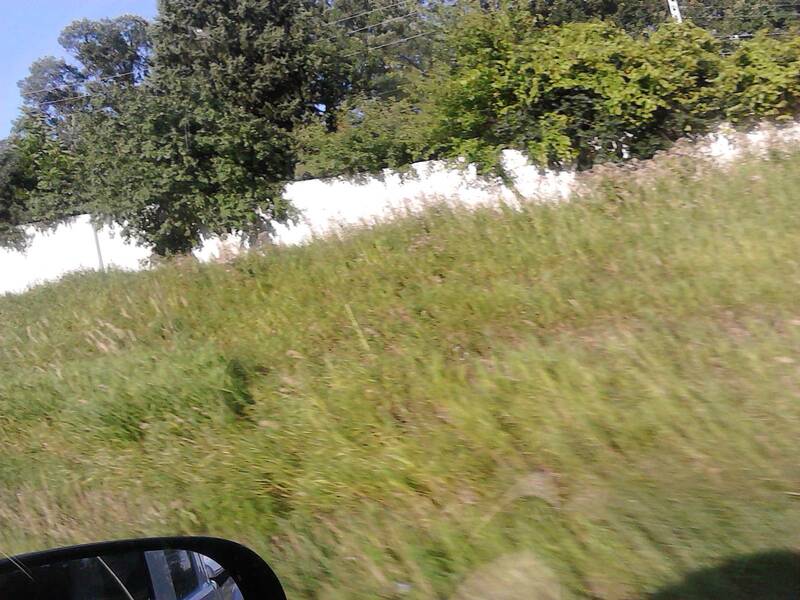 They even have another law that says they CAN cut the first several inches next to the highway for safety so the high grass isn’t right next to the highway. 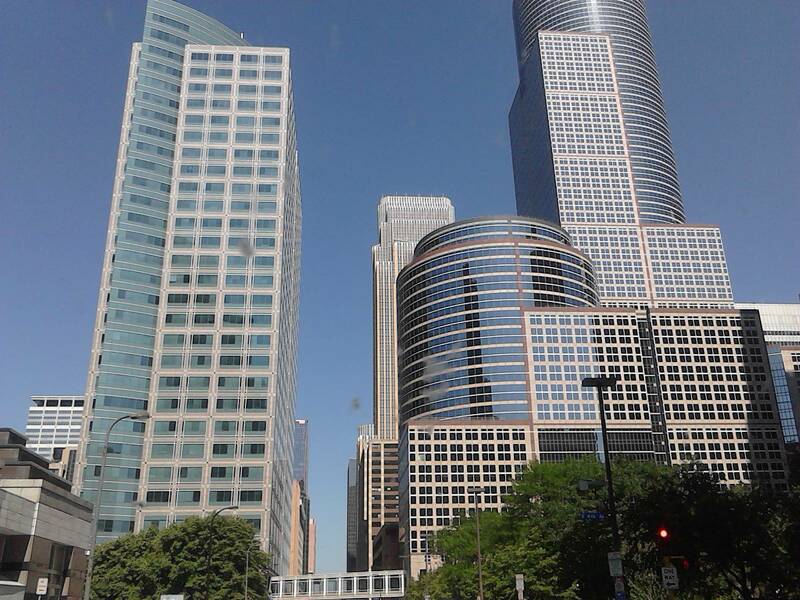 The city of Minneapolis was a very pretty one with some beautiful buildings and the traffic even though it was noon on a gameday was not too bad. Here are a few pictures of the city we saw either walking or driving through. 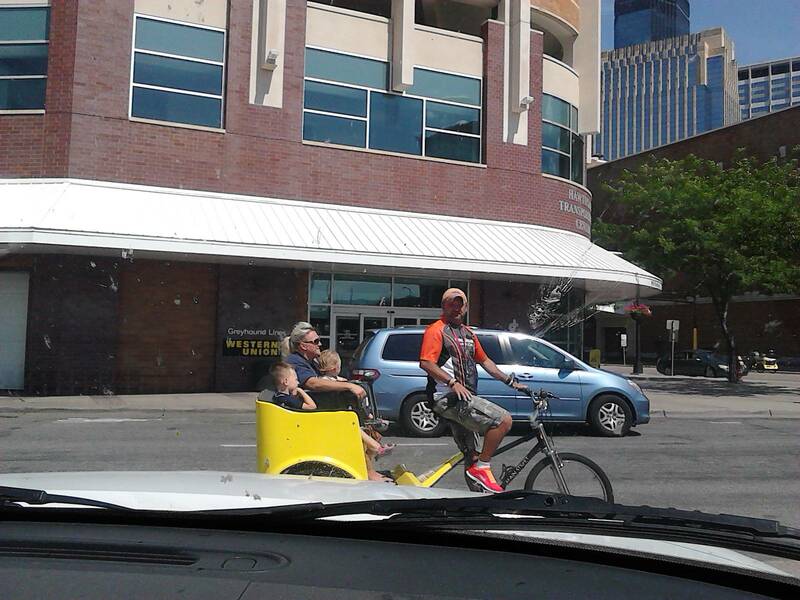 We saw several of these open air bicycle driven taxis around downtown Minneapolis. 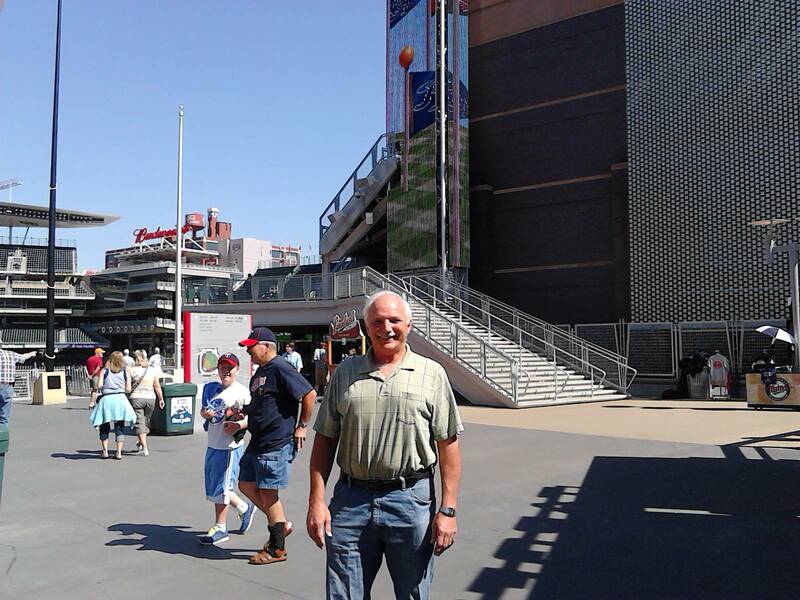 Even though the Atlanta Braves are our team, I hope to be able to visit other ballparks throughout the country as we travel. 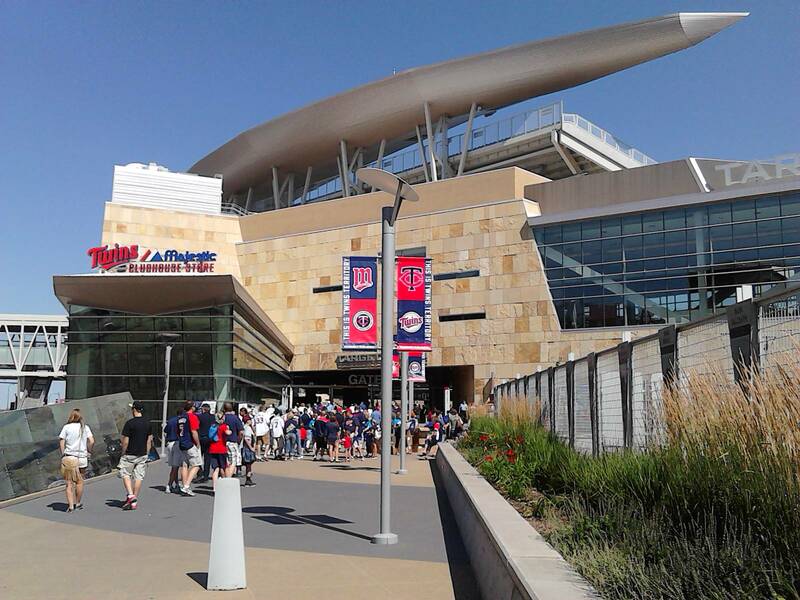 The Minnesota Twins home ballpark is in Minneapolis and we went there to see them play the Kansas City Royals this week. 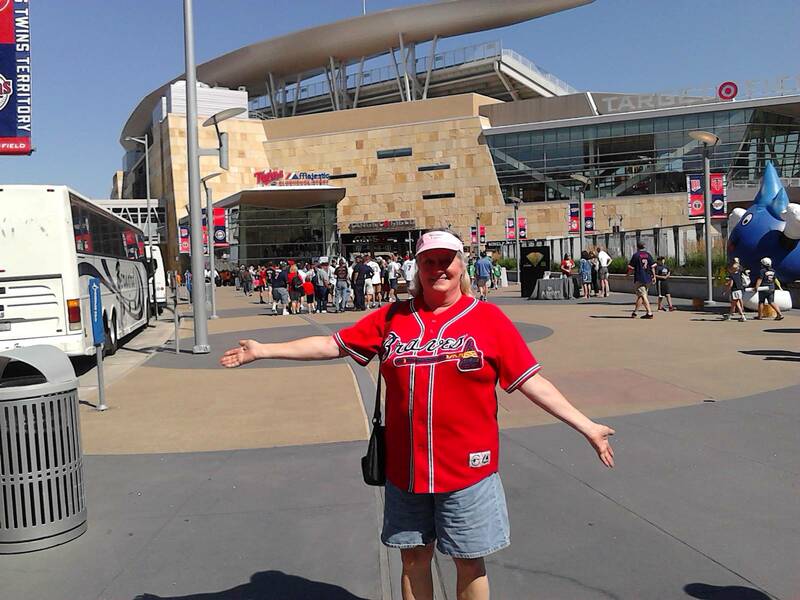 I, of course, wore my Atlanta Braves jersey to the game and surprise, surprise I was the only person there in one! 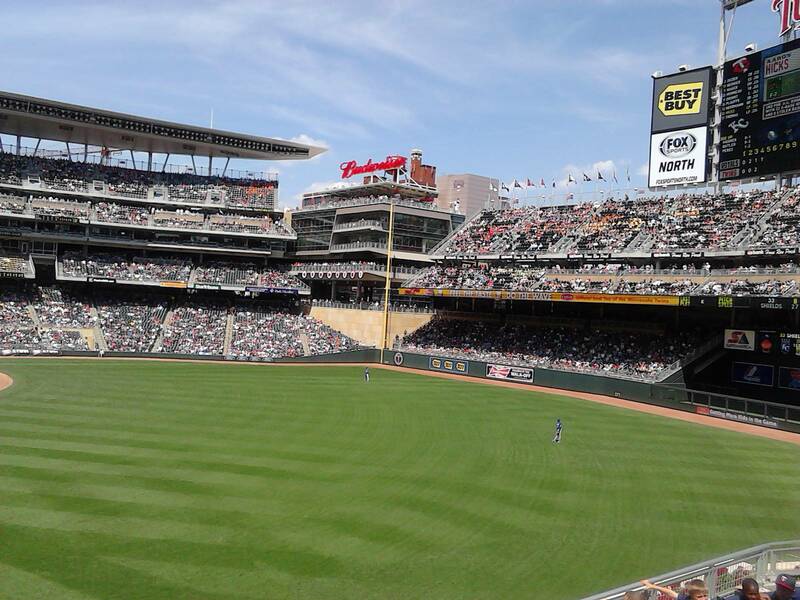 We were surrounded by swarms of Minnesota Twins jerseys. 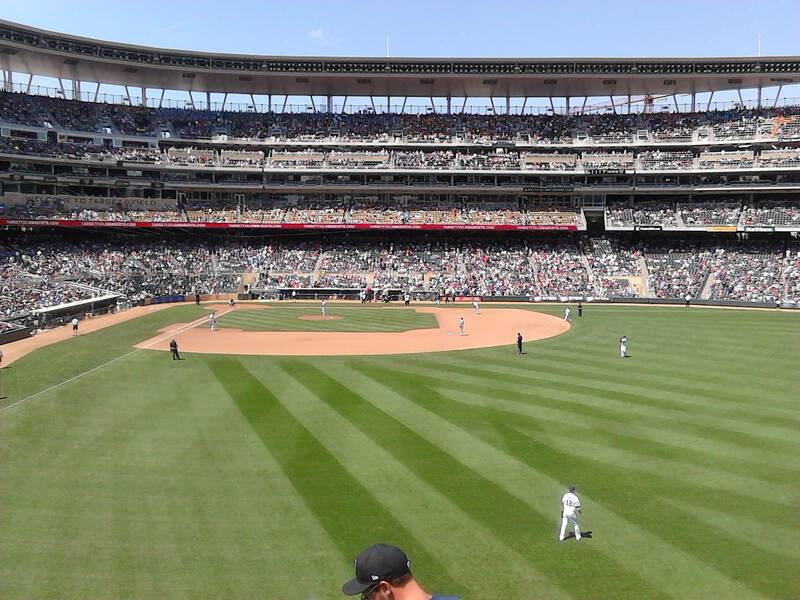 Their park, Target Field, is new and very nice. I am partial to Turner Field in Atlanta and feel it has much more character than this new field but that will come in Minneapolis over time. 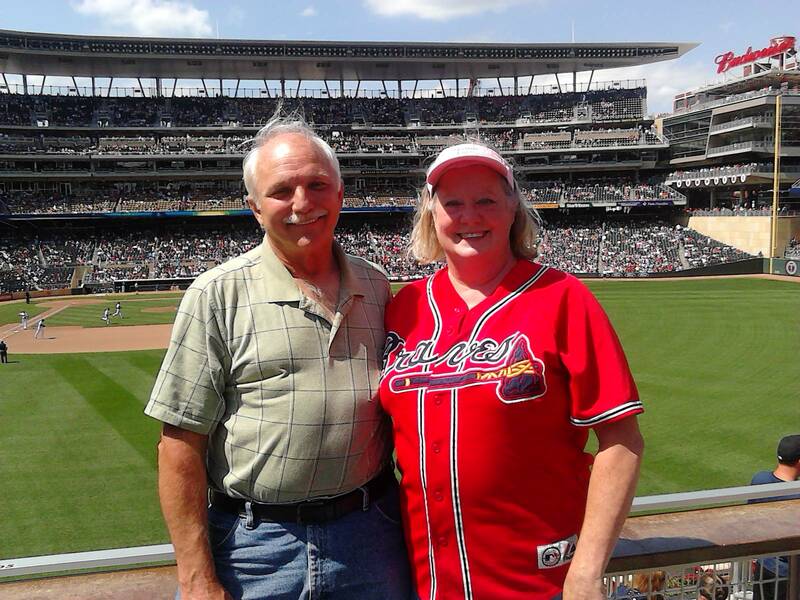 The Twins lost the game but we had fun cheering them on when they made great plays, even wearing the Braves jersey! Our seats were behind right field and were very good seats. 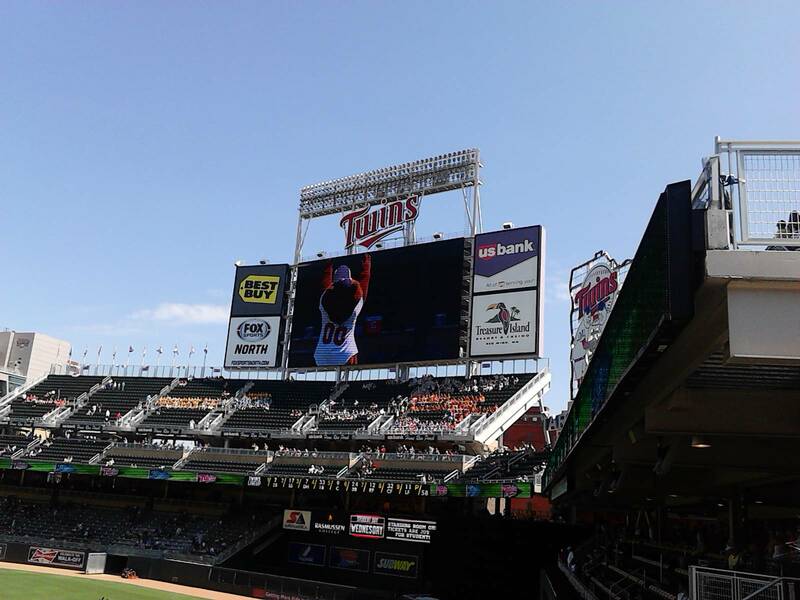 Here’s some pictures of our visit to Target Field. 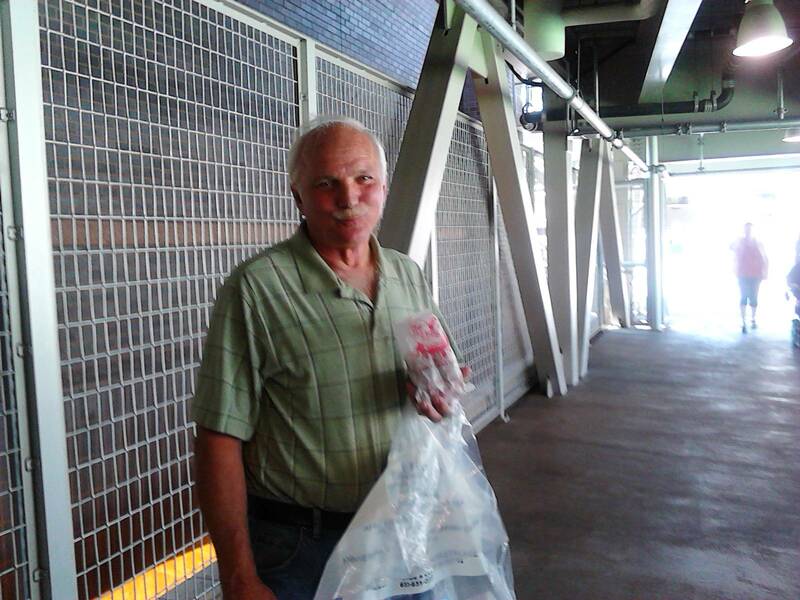 Roy holding our bag of mini donuts! Roy and I just came back from picking raspberries down the road. We got about a cup full which will make a nice topping for some ice cream or maybe some raspberry muffins! 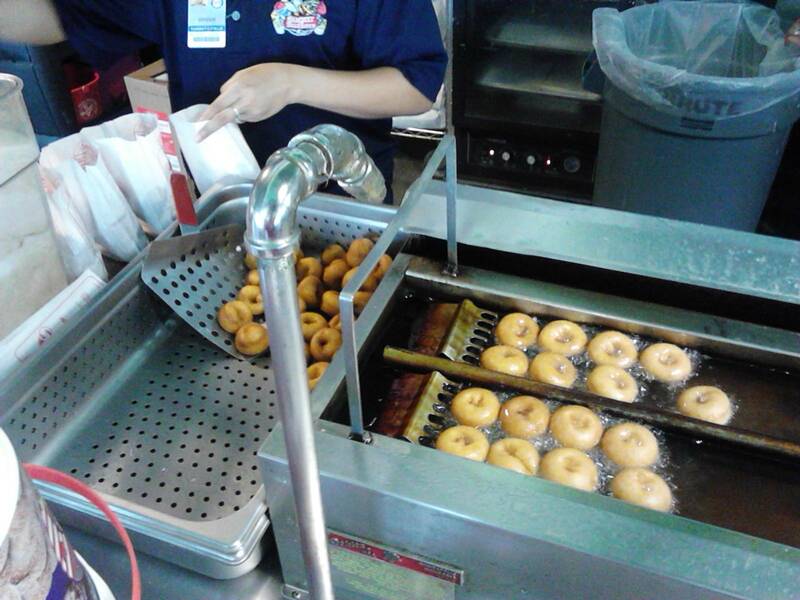 Somehow, all this fresh picked fruit seems to wind up in something sweet and fattening. < 08.03.13 Blueberries, chipmunks and hummingbirds! All I know about or have experienced about Minneapolis is the AIRPORT. It is reported to be the best in the states!! It is beautiful and very functional but HUGE! I have to go through there when I fly to Lincoln, NE, to see Billy and I always have a very long walk (run sometimes) when I change planes. 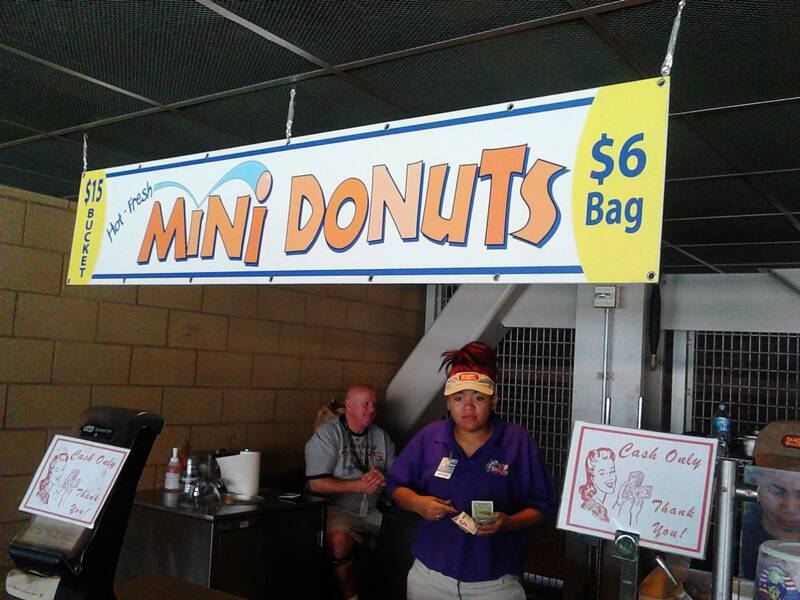 What fun getting to go to the ball game. Still enjoying your great blogs!! I’m sure we only saw a small part of the city. 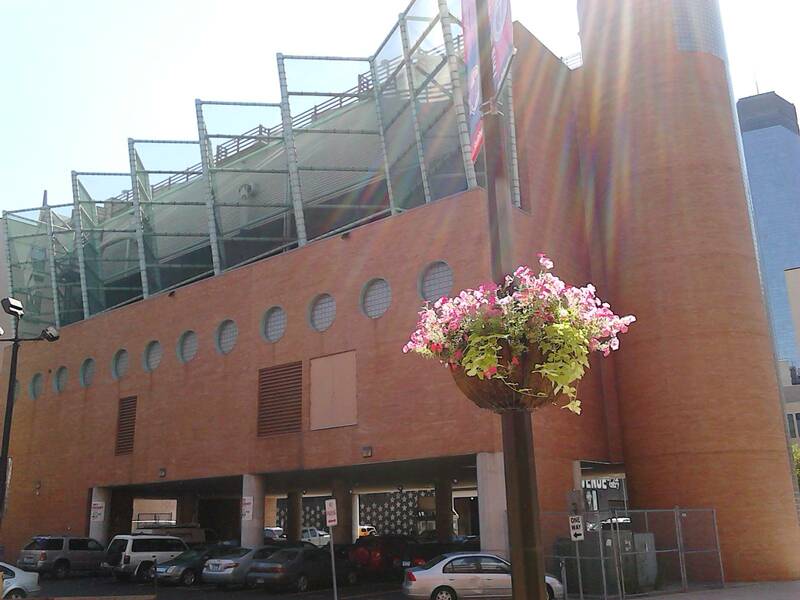 The ballpark is in the middle of downtown so we saw that part mostly. I hope we can do more ball park visits when we start traveling again. Take care and tell your gang hi for us!